Coming from north of Prince Road: Heading east on I-10 (towards El Paso), take the Prince Road exit. Head west towards Business Center Drive. At the stop sign turn right onto Business Center Drive. Take a right onto Commerce Drive. On your left, you will see White Cap Construction Supply. Turn into their parking lot and drive through to the back. KLPX studios are located directly behind White Cap Construction Supply. Coming from south of Prince Road: Heading west on I-10 (towards Phoenix), take the Prince Road exit. Head west to Business Center Drive. At the stop sign turn right onto Business Center Drive. Take a right onto Commerce Drive. On your left, you will see White Cap Construction Supply. Turn into their parking lot and drive through to the back. 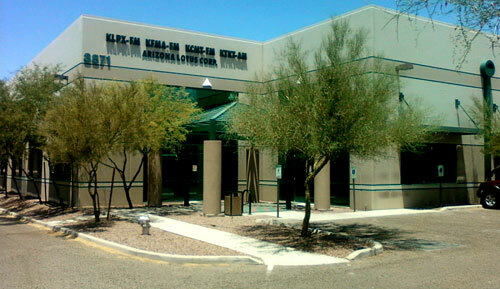 KLPX studios are located directly behind White Cap Construction Supply.